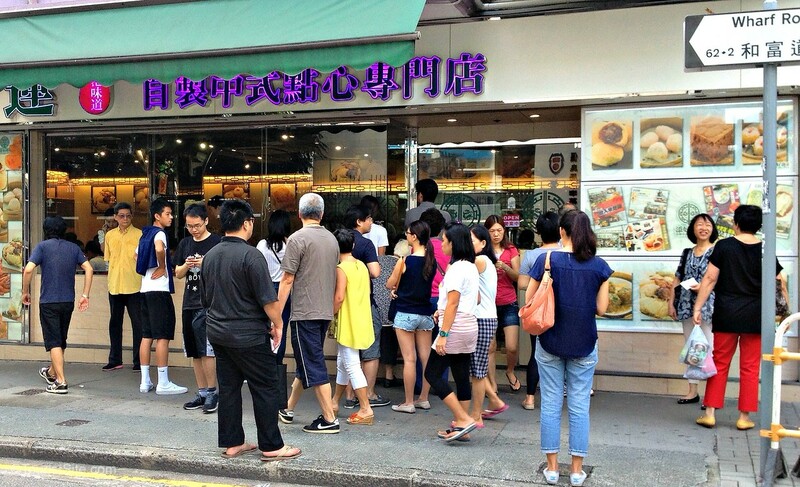 At about 8:30 am we took our place in line at Tim Ho Wan, famous as the world’s cheapest Michelin starred restaurant. There’s a lot of food to try in Hong Kong, as we discovered, and this was a great place to start. Dim sum is a style of Cantonese cuisine served in small or bite-sized portions, often steamed in baskets. It is most common at brunch and is served with tea. There are no reservations at Tim Ho Wan, so we arrived at its Wharf Road location about 30 minutes before opening, and were able to get in the first seating. The service inside is quick, so if you do have to wait the line should move fairly quickly. Many dim sum restaurant have carts of food come by your table, and you can point to what looks good, but at Tim Ho Wan you submit your order on a menu form. We aren’t dim sum experts, so we asked a young man we met in line to help us choose what to order. He ordered a variety of their most popular items, including a variety of steamed dumplings and their famous BBQ park buns. It was more than we could eat, and came to about $15 US. The food is so affordable that you could almost try anything you want on the menu. Between its reputation and price, Tim Ho Wan is a Hong Kong must, and a good benchmark for future dim sum sampling. We really enjoyed the fresh and tasty food, and that’s what it’s all about at Tim Ho Wan. The decor is basic, servers are efficient, and once finished we moved on so others could have their turn. I can see us returning for more dim sum next time we are in Hong Kong. (above) Must-try famous BBQ pork buns – the bun itself is sweet, delicate and crispy on the outside, with a sweet BBQ pork filling; and chicken and sticky rice wrapped in lotus leaf. (below) The opened chicken and sticky rice wrapped in lotus leaf; shrimp dumplings; delicious steamed pork dumplings with shrimp. This kitschy cafe is completely Peanuts everywhere you look, from the Charlie Brown statues and lights, to the Peanuts art on your latte. We were only stopping for coffee and a smoothie, but they also serve a variety of breakfast and lunch items. It has a nice cafe atmosphere for grown up kids, but younger kids would love it too. 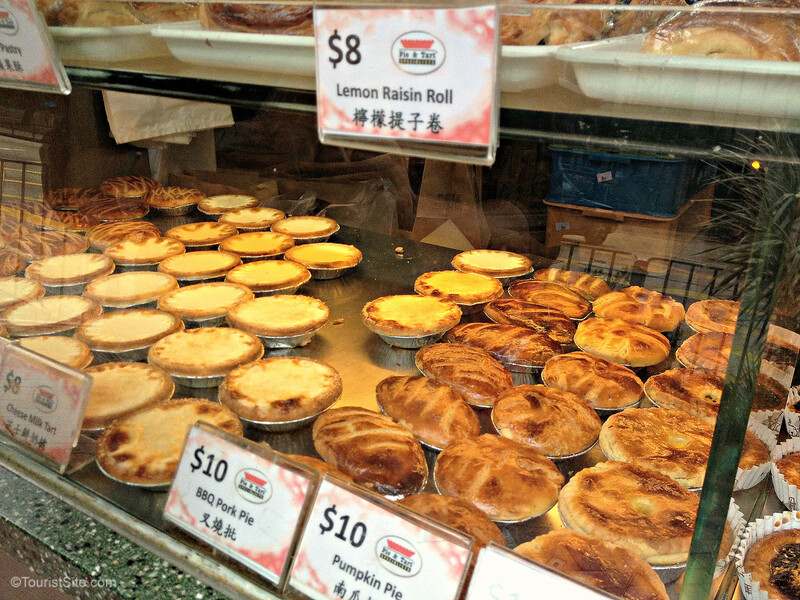 After lots of walking around exploring Hong Kong, you might be looking for dessert or a cheap and tasty snack. Pie & Tart Specialists is a Hong Kong style bakery chain selling sweet and savory pies, and of course they caught my eye. I chose the cheese milk tart, with a delicious still warm custard for HK$8, which is about $1.30 CDN ($1 US). They have counters facing the street, so it’s easy to pick up something to take away. Like most destinations if you just wander around a block or so off the main streets, you can find great food. If the place is busy, that is usually a good sign. 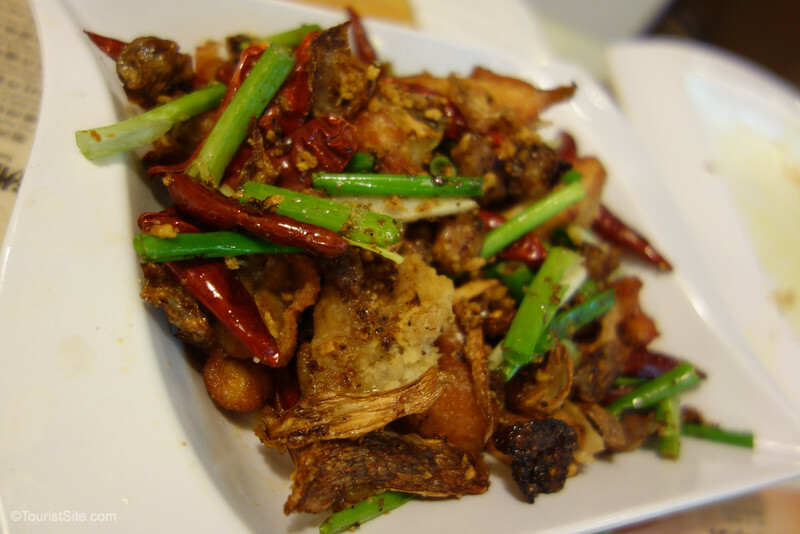 We had one miss on our trip, as happens, but overall we loved the food in Hong Kong. It is such an international city that you can really find any kind of food here, but it’s more fun to eat as the locals do. 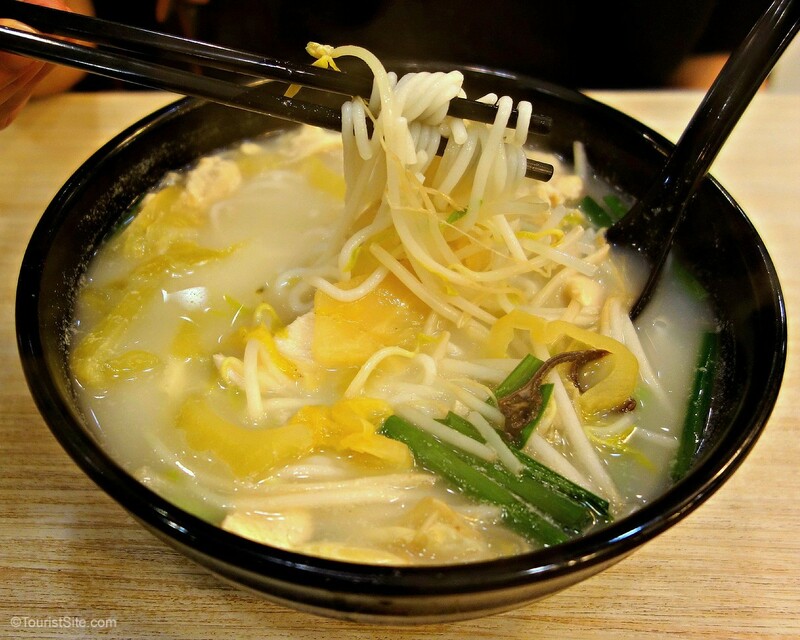 Noodle soups are a delicious and inexpensive option. We ducked into this little soup place when it was pouring rain and it was perfect. It was fun to try Hong Kong versions of menu items we commonly order when we get Chinese take-out at home. 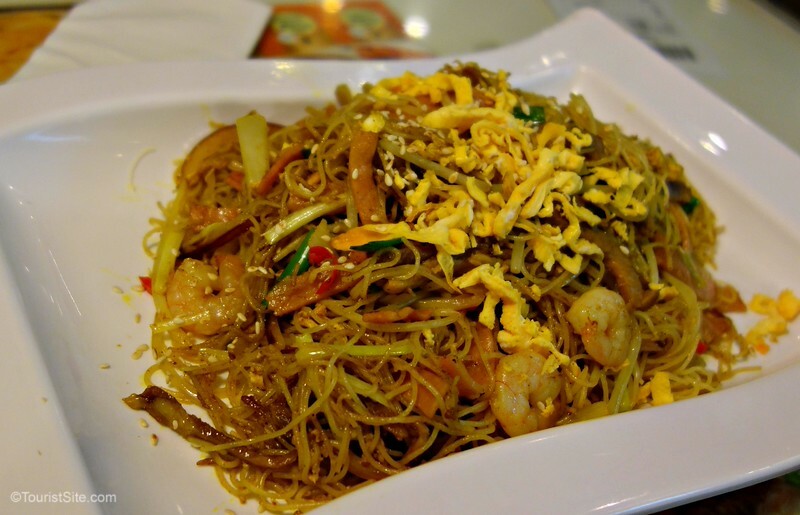 (left) Singapore noodles are my favourite, with stir-fried rice vermicelli, curry, bean sprouts, peppers, bbq pork, and shrimp. Despite the name, it’s not a dish common in Singapore. (right) The spicy ribs with peppers were also delicious. 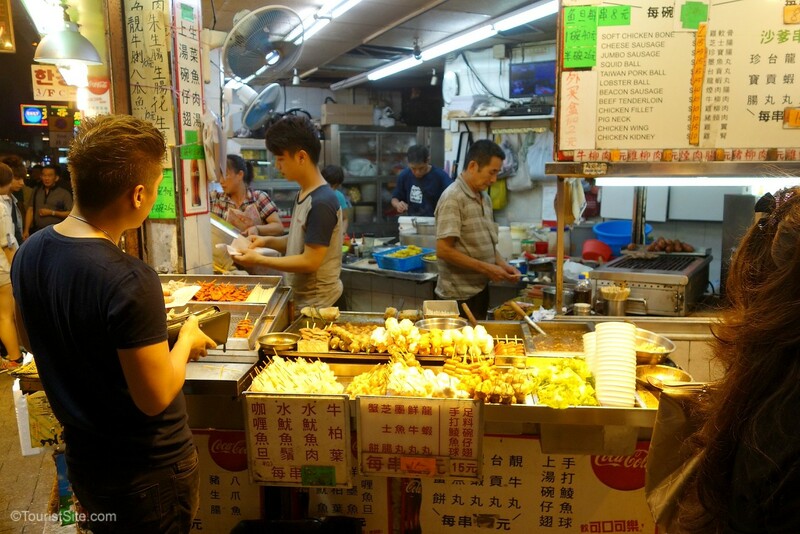 There are numerous options available from street food venders all over Hong Kong. Depending on how adventurous you are feeling, there are all kinds of grilled and fried meats on a stick. You can also find desserts such as freshly-made waffles. Look for crowds to ensure the food is tasty and fresh. I’m looking forward to our next visit for another delicious taste of Hong Kong. 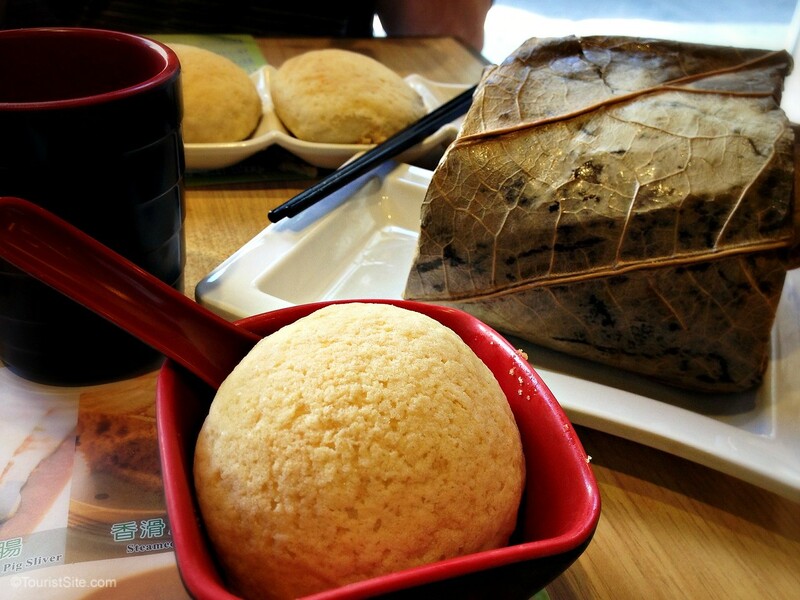 Do you have a favourite Hong Kong food? On my first visit to Hong Kong I grew to understand that fast food is relatively cheap especially at Tim Honesty Wan. That is where I was swept off my feet after experiencing the tantalizing taste of the BBQ Pork Buns. Other than the food the ambiance was great and the staff was very welcoming. The best part was that the food was served in abundance for the reasonable price. I spent time in Hong Kong well before my foodie persona came to the surface. Would love to try a real deal dim sum there! It’s a great foodie destination, We just scratched the surface I’m sure. Hi Shelley – I’d never get past the first stop! Everything looks fabulous and I’d love to try that BBQ pork pie. YUMMY! I would like to try the BBQ pork pie too. Next time! Would love to go to that dim sum place!!! I wonder if they have chicken feet? Michelin-rated chicken feet, that will be one for my soul! Or maybe I will have better luck at the street food markets??? HK is definitely for foodies! Thanks! What a delicious journey! 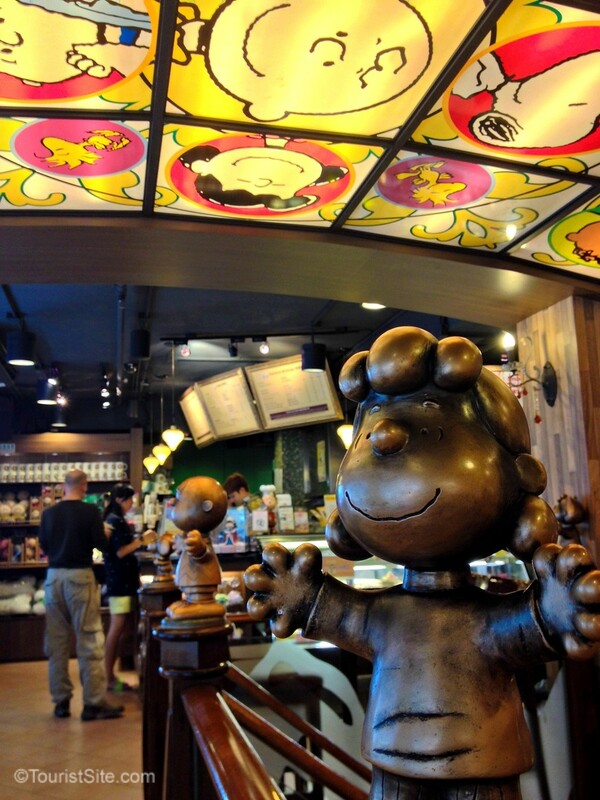 I’m a huge Peanuts fan and would love to eat at the Charlie Brown Cafe in Hong Kong. I think you would LOVE the Charlie Brown cafe! Every item in this post looks delicious to me. Wonderful to think that a traveler can eat so well for so little in a city that can be Very Expensive! It seems Hong Kong has something for every price range. It was fun to visit a place like Tim Ho Wan where you can get Michelin quality for fast food prices. Dim sum is definitely my favorite! I could eat it every day — I did eat it every day when I was in Hong Kong. There’s such a variety of dim sum that I never get tired of it. Since the dim sum places were closed for dinner, I did try out some other street food in the evenings. My mistake not eating more dim sum while I had the chance in Hong Kong! I think I’m going to try some in Calgary and see how it compares. I miss Hong Kong and the food! My highlights would be in Tai Koo Shing, North Point, Causeway Bay, Mid-Levels, Kowloon, and in Sai Kung. So much more to see and eat next time we visit! We did get to the Mid-Levels for dinner one night and tried Nepalese food, which was delicious.